Mosquitoes have killed more than half of all humans who have ever lived — even more than war, plague, famine, and heart disease. By transmitting malaria, mosquitoes cause anywhere from one to 2.7 million deaths each year. And experts say that if nothing is done about it, the annual death toll could double in the next 20 years. Thankfully, human ingenuity is on the case and there are no shortage of ideas. Scientists are aggressively tackling the malaria problem — and indications are that we'll soon turn the tables in our favour. Let's take a look at some of the most promising possibilites. To help us survey some of these efforts, we recruited the help of professor Marcelo Jacobs-Lorena of the Malaria Research Institute of the Johns Hopkins School of Public Health. Not only is Jacobs-Lorena an expert in this field, he is actively working on a cutting-edge solution that could make a profound impact in the struggle to rid the world of this blight. Part of the problem in dealing with malaria and mosquitoes is that both of these organisms are incredibly resilient. Mosquitoes are proving to be a rather hearty species, exhibiting a remarkable resilience when hit with drugs and insecticides. As a result, these kinds of interventions are proving insufficient. And malaria is even worse. According to Jacobs-Lorena, no one has been able to create a vaccine largely on account of its hyper-adaptability to the human immune system. "The parasite lives in very intimate contact with the immune system of its human host," he told io9, "It infects red blood cells and lives in the circulation — so throughout millions of years cycling through humans, the parasite has adapted to escape the human immune system." But as Jacobs-Lorena tells us, a phase 3 trial of a malaria vaccine was recently completed in Africa. The results of the study, which involved over 15,000 children, showed that the vaccine can offer protection against both clinical and severe malaria — an extremely promising result. While a vaccine would certainly be welcome news, scientists are also working on other strategies, including efforts to reduce mosquito populations and to modify the bug itself. One scientist who is working to downsize mosquito populations is Weiguo Fang of the University of Maryland. He's developing a kind of chemical warfare against the insect that involves a fungus loaded with a compound found in scorpion venom. The fungus happens to like mosquitos and it invades their body, slowly killing it. Fang has modified the fungus to target the malaria parasites inside the mosquitoes. His intervention causes impairments to the mosquito's mouthparts, blocking the malaria parasite's path to its human host. As for the scorpine (from emperor scorpions), it attacks the Plasmodium (the malaria parasite) directly. His strategy has been shown to reduce the number of parasites in mosquito saliva by as much as 98%. Another way to control mosquito populations is by interfering with their life cycle. Tullu Bukhari and Bart Knols have developed a strategy that sees a special liquid spread across standing water. The liquid forms a very thin surface film, disrupting mosquito reproduction. Pupae in the water all die within two hours of of the liquid being spread, while none of the larvae get to advance to the the pupa stage. The film also prevents mosquitoes from laying their eggs on the water. The product is called Aquatain AMF, and was originally intended for controlling evaporation from large pools of water. Its Australian inventor, Graham Strachan, claims that the environmental impacts are minimal, and that mosquitoes can't develop resistance. He says it's safe to use on drinking water, and can be applied from simple squeeze bottle. Knols also recently demonstrated a pill during a recent TED Talk. After ingestion, the pill causes the death of any mosquito which bites him. His vision is to see this pill made accessible to a wide population — the idea being that, if enough people take it, the mosquito population could be dramatically reduced. The problem with this idea, of course, is that mosquitoes will adapt quickly. Lastly, Joe Conlon, a technical adviser for the American Mosquito Control Association, has proposed a cocktail of approaches, including the dispersal of larvicide (which is less harmful than pesticides), planting Ovitraps (which attract egg-laying females), and, where possible, getting rid of water sources that help mosquitoes to breed. A different approach, albeit a more controversial one, is genetically modifying mosquitoes. And interestingly, there are several different ideas on the best way to do this. Anthony James from UC Irvine has outlined a plan in which modified genes affect only the female mosquitoes, rendering them flightless. James's strategy results in larvae that are hatched on the water, but with females who are unable to leave. Males remain unaffected and can pass the genetic modification on. Marcelo Jacobs-Lorena has also considered genetic modifications — but his strategy has been a bit different. Rather than work to reduce mosquito populations, he wants to modify the insect such that it is not able to transmit the disease; instead of attacking mosquitoes will belligerent force, Jacobs-Lorena has taken the more elegant Jiu-Jitsu approach. Back in 2002 his team loaded mosquitoes with a modified gene that resulted in the production of a substance that kills off Plasmodium. The result was a transgenic mosquito with an anti-malarial gene. "But the problem with this approach," he conceded, "is that if we want to go to the next step and introduce these genes into mosquitoes in the field, that suddenly becomes a very difficult proposition." Indeed, the prospect of replacing an existing population with genetically modified mosquitoes is incredibly daunting. "While this worked well in the lab," said Jacobs-Lorena, "it was impossible to load wild mosquitoes with the anti-malarial gene." 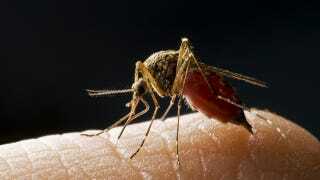 Moreover, should this be done in the wild, biologists must also ensure that the modified mosquitoes out-compete the unmodified ones, so that the gene passes from one generation to the next via natural breeding — and before the malaria parasite evolves a countermeasure. This is the same problem that could be faced by Anthony James and his flightless GMO mosquitoes. This is why Jacobs-Lorena and his team have come up with a better idea. "Like us humans, mosquitoes carry significant microbial flora in their gut — and by sheer coincidence it's the most vulnerable part of the malarial life-cycle," he said. He described how bacteria and the malaria parasite reside in the same compartment. That's when he got the idea that, instead of creating transgenic mosquitoes, he should create transgenic bacteria. "That's a much easier task," he admitted. And indeed, this is exactly what Jacobs-Lorena has done. Along with Sibao Wang, he has engineered symbiotic bacteria from vector mosquitoes. All malarial mosquitoes have Plasmodium in their stomachs, which enters into the blood of every person a mosquito bites. Wang and Jacobs-Lorena discovered a kind of gut bacteria that, when introduced into the guts of mosquitoes, is able to fight off the malaria parasite. In turn, the researchers want to load mosquitoes with this gene. So, instead of an outright genetic modification, they could inject the Plasmodium-killing gene into the bacteria that lives inside a mosquito's stomach. The challenge with this approach, however, is getting the transgenic bacteria into wild mosquitoes in sufficient numbers. One idea is to load sugar-soaked cotton balls with the bacteria, and place them in baiting stations around villages in malaria territory. But assuming this could be done, another problem is whether the malaria could adapt to the bacteria. "That's a very good point," said Jacobs-Lorena, "which is why we developed several effector genes that kills the parasite in different ways." He explained how the bacteria employs multiple strategies — a very deliberate attempt to reduce the probability of selection. "Resistance to one would be just fine," he said, "but it would be extremely unlikely for it to develop all the mutations required to survive all of them." But there are other challenges facing Jacobs-Lorena when it comes to introducing his transgenic bacteria in the field. He told io9 about the difficulties he and others face in dealing with regulatory issues. Even though the GMOs are intended to save lives, there are fears of unintended consequences. Moreover, he will have to convince local populations about what they plan to do and get their approval before they can conduct any experiments. "I feel quite optimistic about the technical aspects," he said, "but it is quite hard to predict how easy or difficult it will be to get approval for actual field releases." But while James' "netted laboratory" follows the traditionally cautious scientific approach, one of his partners has been decidedly more gung-ho about it. Luke Alphey, whose company Oxitec was originally hired by James to design the flightless female genetic modification, is so confident that these genetic warriors work, and that there will be no environmental ill effects, that he has taken advantage of the lack of regulation in many areas to conduct full scale field tests in the wild. Oxitec's historic first release of GM mosquitoes in 2009 killed an estimated 80% of the A. aegypti population on the Grand Cayman island in the Carribbean - a geographically isolated area. More mutant, autocidal mosquitoes have been released in Malaysia, and the technique is reportedly going into large scale production in Brazil. James sees Oxitec's full-speed-ahead approach as a potential risk to the entire science of genetic modification. "That's the difficulty of working with corporations," he told Scientific American, "I can't control corporate partners." Indeed, the GMO cat may already be out of the bag. Malaysia recently released 6,000 genetically modified mosquitoes into the wild to drive down incidents of mosquito-borne dengue fever — and they did so despite protests from environmental groups and NGOs. These precedents show that corporations and desperate countries will take matters into their own hands. Releasing GMO mosquitoes into the wild may seem like an extreme approach, but there's another, more potentially severe idea that's been floating around the ether: The complete extinction of mosquitoes. While nobody in particular is proposing that we do this, Jacobs-Lorena admitted to io9 that some scientists are talking about the possibility. But he cautioned against this "selective extinction" of mosquitoes. First, he warned that mosquitoes are likely to develop a resistance to insecticides. "They're not the magic bullet we're looking for," he said. Second, even if we imagine an ideal situation in which we've eliminated every mosquito from a target area, we've still got a biological niche that's highly favorable to mosquito populations. "All it would take are a couple of mosquitoes to fly in from a neighboring area," he said, "and since the niche remains intact, the population will quickly return to previous levels." But an all-out assault doesn't have to involve the complete eradication of the insects. As the work of all these scientists has revealed, there may never be one best approach to dealing with the malaria problem. In fact, none of these approaches may work — but an orchestrated assault could yield tremendous results. If anything, these promising lines of research shows that malaria's days are likely numbered. Top image via Dmitrijs Bindemanis/Shutterstock.com. Inset images via PLOS, Green-Flow, TopNews.in, pmi.gov.